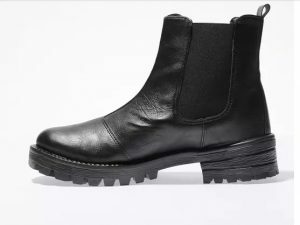 The hardest thing about buying a pair of vegan Chelsea boots is choosing one out of the many many available options. 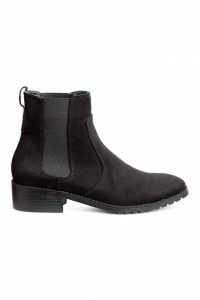 Most of the vegan shoe companies make at least one type of Chelsea boots, and if you look around you can also find some from big high street brands that make a perfectly stylish, affordable alternative. Here are 10 different styles I’ve been eyeing up. A chunky, modern take on the classic. 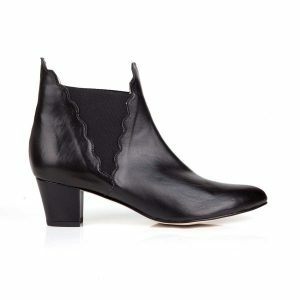 The Alanis boots from 100% vegan brand, Bourgeois Boheme. 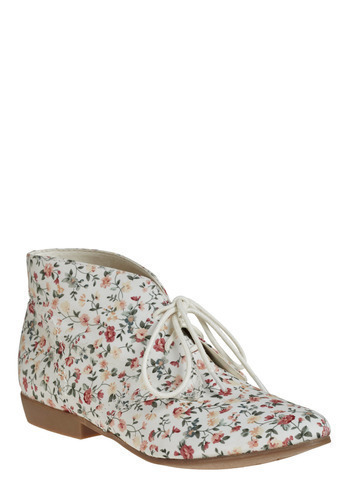 They’re classic Chelseas, coupled with a creeper-like platform sole. Sort of understated alternative. Can’t really go wrong with a classic. 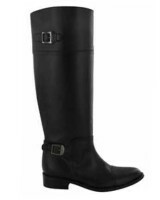 These chestnut brown women’s boots have deepish tread and a classic cut. I’ve chosen this colour to add some variety to this post, but these are also available in black and dark brown. Very reasonably priced at £85. Iconic style meets 90s revival! 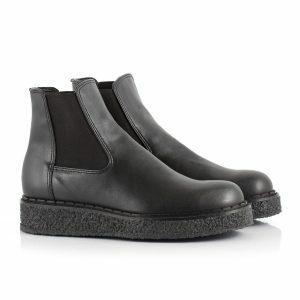 Classic Chelsea style with a chunky, deep tread sole to give it that extra underground edge. These are from Schuh’s own brand and are apparently 100% vegan friendly. Cute boots from Nae, a 100% vegan company. These are seemingly a tiny bit shorter than the rest of these styles and come with a nice brogue-ish pattern on the vamp. Also: shiny! 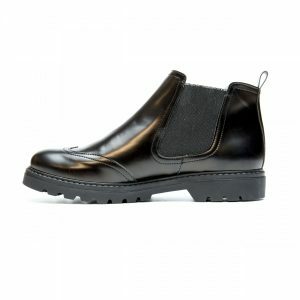 A cute boot from Nicora, a 100% vegan company from America. 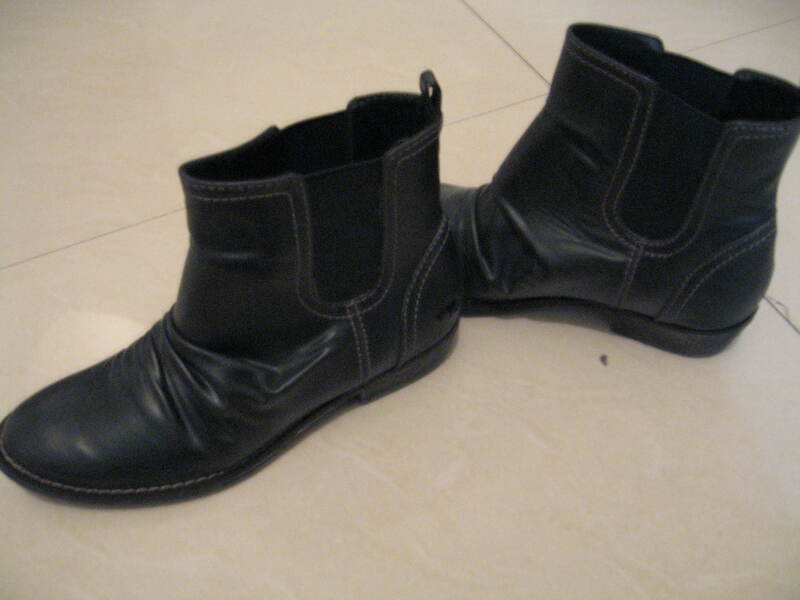 They also make black Chelseas with a chunkier sole. I liked these because of the pattern around the elastic panels. 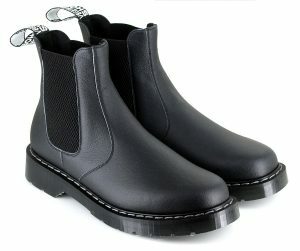 Dr Martens have been making classic boots for decades and their Chelsea boots have been available in vegan leather for a while now. These are unisex and true to form, with the famous yellow stitching and everything. 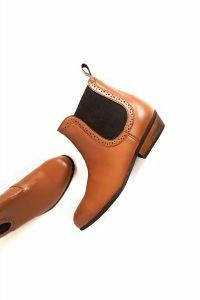 In fact, these are probably what most people think about when they think about classic Chelsea boots, so now you can have a pair of your own. 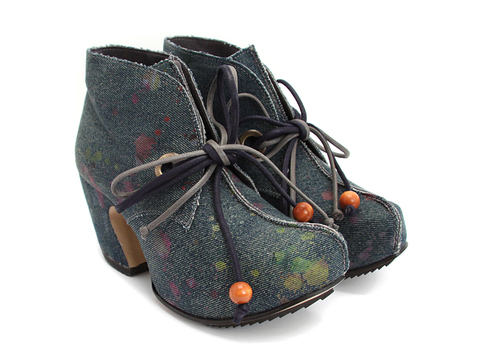 The smartest, girliest entry in this post comes from vegan designer shoe company, Beyond Skin. 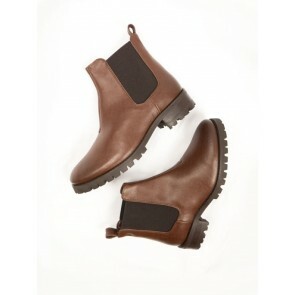 These smart, somewhat frilly Chelsea boots have a very feminine, yet sensible block heel. It’s more of a wink to the traditional Chelsea style that you can wear with smarter outfits, really. Sort of like a grown up version, if you wish. 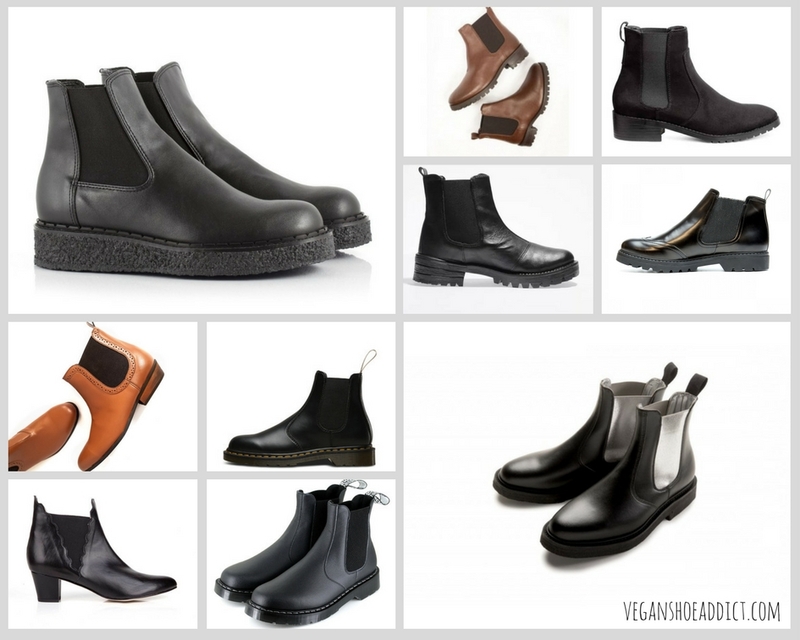 No list of vegan Chelsea boots would be complete without the Vegetarian Shoes Airseal version. 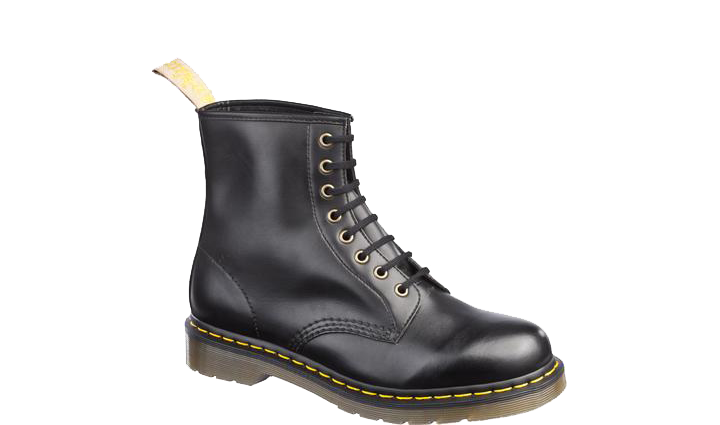 It’s similar to the Dr Martens one but the toes are a bit rounder and the stitching is white. Of course, the pull tab also has the famous “Vegetarian Shoes” logo. 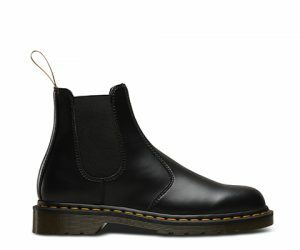 I think I might actually prefer the shape of these to the Docs. Obviously, these will last forever and are going to be pretty damn comfortable. 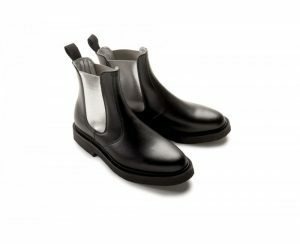 These super cute black & silver boots are part of a small but beautifully formed collection of unisex vegan shoes and boots from London. I love the silver twist on these. There are all kinds of other promising colour combination, including ones where the main boot is in silver. These are both timeless and very on trend, which is basically the perfect combination.